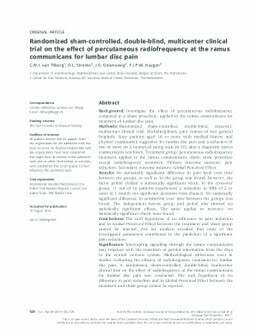 Background: Investigate the effect of percutaneous radiofrequency compared to a sham procedure, applied to the ramus communicans for treatment of lumbar disc pain. Methods: Randomized sham-controlled, double-blind, crossover, multicenter clinical trial. Multidisciplinary pain centres of two general hospitals. Sixty patients aged 18 or more with medical history and physical examination suggestive for lumbar disc pain and a reduction of two or more on a numerical rating scale (0-10) after a diagnostic ramus communicans test block. Treatment group: percutaneous radiofrequency treatment applied to the ramus communicans; sham: same procedure except radiofrequency treatment. Primary outcome measure: pain reduction. Secondary outcome measure: Global Perceived Effect. Results: No statistically significant difference in pain level over time between the groups, as well as in the group was found; however, the factor period yielded a statistically significant result. In the crossover group, 11 out of 16 patients experienced a reduction in NRS of 2 or more at 1 month (no significant deviation from chance). No statistically significant difference in satisfaction over time between the groups was found. The independent factors group and period also showed no statistically significant effects. The same applies to recovery: no statistically significant effects were found. Conclusions: The null hypothesis of no difference in pain reduction and in Global Perceived Effect between the treatment and sham group cannot be rejected. Post hoc analysis revealed that none of the investigated parameters contributed to the prediction of a significant pain reduction. Significance: Interrupting signalling through the ramus communicans may interfere with the transition of painful information from the discs to the central nervous system. Methodological differences exist in studies evaluating the efficacy of radiofrequency treatment for lumbar disc pain. A randomized, sham-controlled, double-blind, multicenter clinical trial on the effect of radiofrequency at the ramus communicans for lumbar disc pain was conducted. The null hypothesis of no difference in pain reduction and in Global Perceived Effect between the treatment and sham group cannot be rejected.